It’s easy to dismiss this by thinking you will avoid using an airplane with your children, but sometimes unexpected situations can crop up where you don’t have a choice. To prevent a nightmare scenario of putting up with their screams, intolerance, or loudness then it is probably a good idea to read up on some useful hints and tips to make your journey stress free! 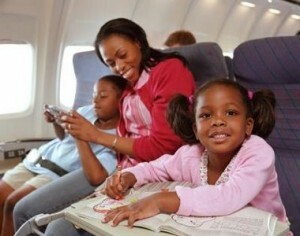 To keep them preoccupied make sure you pack plenty of toys, favorite bears, snacks, a book and even coloring crayons. Keeping them engaged with numerous fun activities will minimize boredom. Even a pen and paper and playing tic-tac-toe will be effective in keeping your child busy. Tip: Always ensure you have more than one favorite item, in cases of leaving anything behind when leaving the flight; as you still have the returning journey to think of too. Organization and planning is the key to travelling with your children. If you book early online you can choose your seats, and by arriving at check-in early too you should minimize the stress and having to rush around. Hint: Pre-planning your journey, checking for traffic black spots, and leaving yourself plenty of time (taking into consideration the time allowances required when your child may be disruptive) to get where you need to be! You should always take a bottle of Calpol, just in case if your child gets poorly onboard the flight. It’s a circumstance that can be very distressing; so anything to relieve symptoms will help. If your child doesn’t cope with the altitude change, then eardrops are very effective in easing the pressure for them (along with a bag of sweets to chew). Also, if your child suffers from any other condition which you need medication for; then ensure you are carrying a plentiful supply (and consult the child’s GP on advise). There’s nothing worse than a child screaming on a flight, especially for the other passengers who want to get some rest, or just want a peaceful flight. Be polite and friendly, and encourage your children to give sweets and interact in a friendly manner to those sitting around you. If your surrounding neighbors are on speaking terms, then they are far more likely to offer help, or be understanding if such an event occurs. Warning: In some rare circumstances you may get someone being rude or obnoxious which should not be tolerated, so make sure you inform one of the flight crew if this is the case! If you are taking a long-haul flight to somewhere then it is really worth considering dividing the flight with stops at air-ports on route. The whole time in the air may be too distressing for your child, especially if they are young; so this way you can ensure breaks and refreshments at an airport. Just by being able to walk around, and give them freedom; will completely refresh them for the next part of the journey. Flights with stop over changes are very common amongst family holiday packages, so is worth researching and pre-planning a good way to conduct your flight.